Valhalla will have to wait. History has renewed its Vikings TV show for a sixth season, ahead of season five, which premieres on Wednesday, November 29, 2017 at 9:00pm ET/PT. Production on the sixth season will begin in Ireland, this fall. So far, there is no news on whether season six will be the final installment of Vikings. When we know more, you will too. Airing on the History channel, the first four seasons of Vikings takes place in the brutal and mysterious world of Viking warrior and farmer Ragnar Lothbrok (Travis Fimmel). 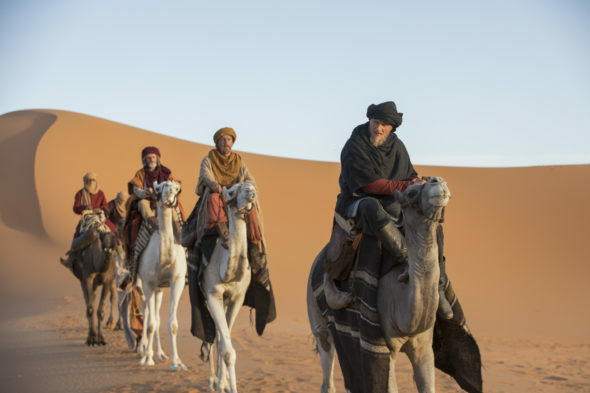 The cast also includes Linus Roache, Katheryn Winnick, Alexander Ludwig, Gustaf Skarsgård, Clive Standen, Alyssa Sutherland, Ben Robson, Moe Dunford, Lothaire Bluteau, Jasper Pääkkönen, Kevin Durand, Peter Franzén, Morgane Polanski, Amy Bailey, Moe Dunford, John Kavanagh, and Jonathan Rhys Meyers. The fourth season of Vikings averaged a 0.66 rating in the 18-49 demographic with 2.27 million viewers. Compared to season three, it was down by 19% and 7%, respectively. Find out how Vikings stacks up against other scripted History TV shows. Learn more about the Vikings season six renewal from this History press release. New York, NY – September 12, 2017 – HISTORY has ordered a 20 episode sixth season of the hit drama series “Vikings,” it was announced today by Eli Lehrer, Executive Vice President of Programming, HISTORY. Additionally, series regular Katheryn Winnick is set to helm one episode in season six, marking her directorial debut. Production for season six is slated to begin this fall in Ireland. The previously ordered 20 episode fifth season will air in two parts, beginning with a two-hour premiere on Wednesday, November 29 at 9PM ET/PT followed by eight episodes airing every Wednesday at 9PM ET/PT. The remaining ten episodes of season five are slated to air in 2018. Across all platforms, the last season of “Vikings” averaged 7.8 million viewers per episode. “Vikings” is a top five drama across ad supported cable and averaged 4.1 million total viewers last season in Live+7 delivery. Additionally, the series reached 34.3 million total viewers in linear Live+7. “Vikings” is the critically acclaimed series from creator and sole writer Michael Hirst (Academy Award® winning film Elizabeth and the Emmy® and Golden Globe® nominated series “The Tudors”) and is a family saga that tells the remarkable tales of the lives and epic adventures of the raiders and explorers of the Dark Ages. Season five cast includes series regulars Jonathan Rhys Meyers (“The Tudors”), who joined this season, as “Bishop Heahmund” along with Katheryn Winnick (“Lagertha”), Gustaf Skarsgård (“Floki”), Alexander Ludwig (“Bjorn”), Alex Høgh Andersen (“Ivar the Boneless”), Jordan Smith (“Ubbe”) and Marco Ilso (“Hvitserk”). Winnick’s role as Lagertha has garnered her a “Best Supporting Actress” nomination at the 2015 Critic’s Choice Television Awards and a “Best Performance by a Lead Dramatic Actress” nomination at the 2014 Canadian Screen Awards. Winnick most recently appeared in the adaptation of Stephen King’s The Dark Tower opposite Idris Elba and Matthew McConaughey. Next up she will star opposite John Travolta in the upcoming film Cigarette. Her other credits include Love & Other Drugs and 50 First Dates. Winnick is repped by CAA, Alchemy Entertainment, and attorney Jeff Bernstein of Jackoway, Tyerman, Wertheimer, Austen, Mandelbaum, Morris, & Klein. Hirst serves as executive producer along with Morgan O’Sullivan of World 2000 (The Count of Monte Cristo; “The Tudors”), Sheila Hockin (“The Tudors,” “The Borgias”), John Weber of Take 5 Productions (“The Tudors,” “The Borgias”), Sherry Marsh, Alan Gasmer, and James Flynn (“The Tudors,” “The Borgias”). Arturo Interian serves as the executive in charge of production for HISTORY. “Vikings” is an iternational Irish/Canadian co-production by World 2000 and Take 5 Productions. MGM Television serves as the worldwide distributor outside of Ireland and Canada. “Vikings” is produced in association with Corus Entertainment. HISTORY®, now reaching more than 96 million homes, is the leading destination for award-winning series and specials that connect viewers with history in an informative, immersive and entertaining manner across all platforms. The network’s all-original programming slate features a roster of signature series including Pawn Stars, American Pickers, The Curse of Oak Island, Aloneas well as the hit drama series Vikings and SIX. The HISTORY website is located at history.com. Follow us on Twitter at twitter.com/history and Facebook at facebook.com/history. What do you think? Are you still watching the Vikings TV series? How many seasons do you expect it to run on History? wow love the historic realism. want more VIKINGS. We love this show. The history channel has had THE best shows by far. My husband and I cant wait to see what the show has in store for the next season. Love the characters, excellent acting and fantastic wardrobes and sets. My interest in the show died with Ragnar. Travis Fimmel deserves and award for his performance! Bring back Ragnar and Rollo!!!!! Love the show – they better renew it! Omg! Best show ever. Can’t wait for the next season. WHEN? Sooo inconsiderate to not warn of spoilers. I’m devastated. Thanks a lot. I am hooked on Vickings. I can’t wait for another season. I’m looking forward to as many seasons as possible! Love all the cast through the seasons, miss Travis Rimmel. Adore this show and look forward to it every week! Loved this show & watched every episode over & over again. CAN’T WAIT FOR IT TO BE ON AGAIN!!! Love this show!! Excellent craftsmanship! Please keep it……. It’s a religion to me. I will follow ….